Ann D. Fillingham's principal areas of practice include public and structured finance, infrastructure finance, and transactional work for financial institutions. In the public finance arena, Ms. Fillingham has served as bond counsel and underwriter's counsel to numerous state and local issuers. She has built a reputation for innovative and creative lawyering, serving as an integral part of many of her client's most important financial restructurings. She has worked extensively with the State of Michigan and its various departments and authorities with respect to both taxable and tax-exempt issues. 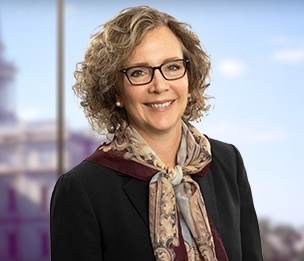 In addition, she has served as bond counsel or underwriter's counsel on many county, municipal, school and local authority bond issues and many conduit transactions for acute care and continuing care facilities, and economic development projects. Ms. Fillingham is a member of the Board of Directors of the National Association of Bond Lawyers (NABL), regularly speaks at NABL conferences on matters related to public finance, is a past NABL Steering Committee member and is the past Chair of the NABL's Bond Attorneys' Workshop and its Municipal Law Committee. In the corporate and finance arena, Ms. Fillingham also works extensively with financial institutions, structuring and documenting both taxable letter of credit enhanced debt offerings and commercial finance transactions. Her areas of practice include transactional negotiation and documentation, commercial lending and federal and state regulatory compliance work for lending institutions. Bond counsel to the Michigan Finance Authority restructuring $226 million of public debt of the School District of the City of Detroit, Michigan to match-fund new security cash flows, as part of a larger governmental restructuring. Underwriter’s counsel for Barclays on the City of Detroit, Michigan $606 million financing, publicly refunding prior City municipal obligations post-bankruptcy. Bond counsel to the Michigan State Building Authority on its 2011 $648 million, 2013 $583 million, 2015 $989 million and 2016 $665 million new money and refunding transactions, securing present value savings and allowing the Authority to consolidate all its $2.9 billion of debt in a single bond indenture. Bond counsel to the Michigan Finance Authority on a $11 million tender and related $16 million refunding and reoffering of the City of Allen Park, Michigan, allowing the City to restructure debt for a failed movie studio project which had been the basis for SEC investigations and cease and desist orders. Provider counsel in connection with an agreement with the Michigan Department of Transportation for freeway lighting as a design-build-finance-operate-maintain project. Counsel to Detroit Water and Sewerage Department on a $5 billion voluntary open market tender solicitation and related $1.79 billion refunding transaction capturing present value savings, avoiding a bankruptcy-related cram-down and obtaining consents necessary to implement the system transfer to the regional Great Lakes Water Authority. Underwriter’s counsel on a $185 million financing for a Public Lighting Authority street lighting project. Underwriter’s counsel for Barclays on the City of Detroit, Michigan $120 million post-petition financing, together with its $275 million exit financing, consummated on date of City’s exit from bankruptcy. Underwriter’s counsel on a $2.9 billion Michigan Finance Authority issuance of Unemployment Obligation Assessment Revenue Bonds, which enabled the State of Michigan to utilize the public markets to achieve savings and restructure a significant federal liability. Counsel to the Michigan Higher Education Student Loan Authority on its $1.01 billion monetization of its student loan authority portfolio through a federally established finance conduit established following collapse of the auction rate securities market; also acted as bond counsel to the Authority in issuance of FRN and other related financings to secure long-term take-out funding of the interim facility. Bond Counsel to the Michigan Tobacco Securitization Finance Authority on $202 million and $523 million bond issues, securitizing Michigan tobacco related revenues to fund State projects.